FREE shipping for the following products with purchase of Subscription Plan. The goal of this exciting game is to collect the most quartets (groups of four) by using memory and strategy skills. At the same time, this fast-paced game introduces players to the different fields of science while learning fun facts provided on each card (such as, "The giant clam can be 4.5 feet tall and weigh 500 pounds"). Sci-ology is a fascinating game that is a blast for the whole family and will be played over and over again for many years to come. 48 oversized (4" x 6") colorful fun fact-filled cards! In this simulation of a real paleontology fossil dig, children dig for a fossilized shark tooth, brachiopod shell, gastropod shell, and "squid" shell. These real -millions of years old- fossils are enclosed in a cool "brick" and are revealed by using the supplied scraping and brush tools (similar to what real paleontologists use). Young paleontologists then take a closer look at these fossils with the enclosed magnifying glass and learn fascinating details about each fossil using the provided fun fact sheet. The easy-to-open tube also serves as a display case for the discovered fossils which can then be treasured for many years to come. DIG REAL FOSSILS is an exciting and fascinating introduction to paleontology and is sure to be a sensation with children of all ages! THREE TRADITIONAL GAMES WITH A SCIENCE TWIST! Match the animals to their tracks while playing concentration, bingo, and guess the tracks games. This unique game is exciting, fun, and educational as players match cards of photographed animals to their tracks. 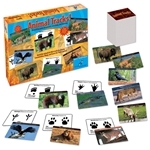 Animal Tracks comes with 80 high quality and colorful cards, a plastic storage tray, and detailed instructions for three games. Animal Tracks is a blast for the whole family and will bring out the animal tracker in all. Children under 8 can choke or sufficate on uninflated or broken balloons. Adult supervision required. Keep uninflated balloons from children Discard broken balloons at once. Ms Frizzle and her students take Young Scientists on a wild ride into the mysteries of rainbows with these awesome experiments. Young Scientists wear rainbow glasses, design a rainbow spinner, blow rainbow bubbles, make rainbow milk, bend white light, mix colored paddles, bounce light waves off ceilings, recreate Newton's prism experiment, and much, much more! Seatbelts, everyone! Get ready to discover The Mysteries of Rainbows! Small parts. Toy contains small balls. Not for children under 3 years. Ms. Frizzle and her students take Young Scientists soaring into flight with a dozen dynamic experiments. Youngsters build a balloon-jet, experiment with parachutes, make a spinner soar, create the ultimate paper airplane, make paper magically rise, move floating ping pong balls, collapse a juice box, fly a glider, lift off rockets, and more! Seatbelts, everyone! Get ready to Soar into Flight! Ms. Frizzle and her students take Young Scientists on a wild ride into the secrets of space with spectacular experiments. Youngsters construct a night-vision flashlight, design a solar system mobile, build a constellation box, draw constellation cards, recreate the phases of the moon, make a model of a solar eclipse, observe magic beads change color, assemble a working telescope, and more! This thrilling kit includes an interactive space poster with sheets of planet and star stickers. Seatbelts, everyone! Get ready to discover The Secrets of Space! Ms. Frizzle and her students take Young Scientists diving into slime, gel, and goop with fun and fabulous experiments. Young Scientists discover oobleck, produce glue from milk, grow jiggly marbles, make snow from super-absorbent crystals, form a bouncy ball, create slime, expand super-absorbent gel crystals, melt fake snow, learn about polymers, and much, much more! This polymer kit includes extra gels, super-absorbent crystals, and marbles to repeat the fun! Seatbelts everyone! Get ready to Dive into Slime, Gel, and Goop! Ms. Frizzle and her students take Young Scientists on a wild ride by going green with experiments and activities that can Save our Earth! Young Scientists recreate the water cycle, build a compost tube, shrink plastic, magically make packing peanuts disappear, decompose food with fungus, form pulp, create new paper, design recycled paper shapes, learn about the 3 R?s, and much, much more! Seatbelts, everyone! Get ready to explore and Go Green!